Currently on its 26th year since inception, CEMS Global has expanded operation across three continents. The organisation has gained reputation as a multinational exhibition organiser averages 40 trade exhibitions per year. Originating right here in Bangladesh, the multinational company is now operates based in New York, United States. CEMS-Global now has offices in India, China, Bangladesh, Sri Lanka, Indonesia, Brazil and 10 Associate offices in other parts of the world. 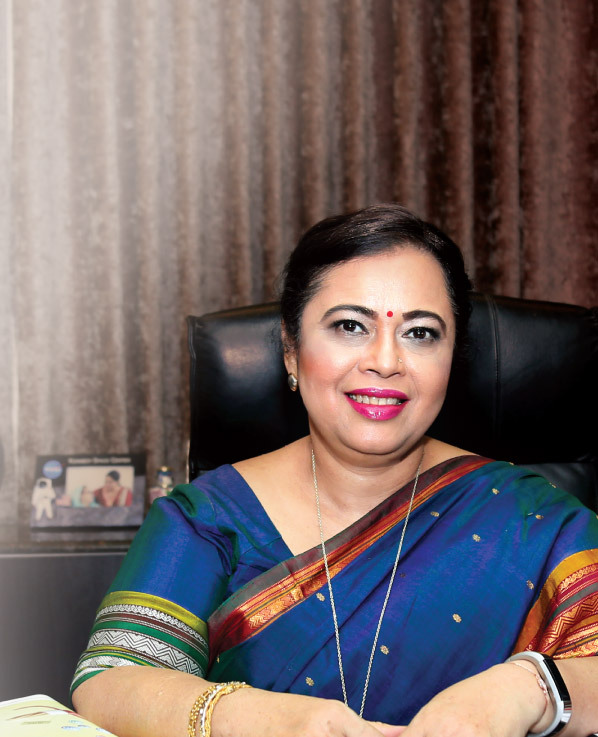 Fintech sat down with the group’s president and managing director Meherun N Islam to know more about the organisation, its operation and the event management industry in general. FINTECH: Tell us a little bit about your background and how CEMS Global started. We started CEMS Global in 1992, before which we had an advertising agency called Market Edge Ltd. What I saw was that everyone was approaching promotion work within a very limited and traditional manner. Whether it’s marketing or simple promotion, in the developed world they were constantly evolving and doing things differently. I used to travel a lot and that’s how I was exposed to the practice in many developed countries. It’s not just the the method of working that was different, but private companies organised trade shows and exhibition with a very acute understanding of the business context. Whereas, the kind of trade fairs we had in Bangladesh were not much different than village fairs. I felt then that much can be done in this area. I started in 1992 with exhibition for construction material company Method and Equipment. This was a big hit. The problem with the traditional way of doing exhibition is that people think that the fair is like regular consumer fair for boutique items like clothes. But that’s not what should happen. If it’s a business focused show and you get a wrong audience then visitors leave the show without any clue what it was about. That’s why I aimed to make the exhibitions very focused. We started working sector by sector. We did exhibitions for computer equipments, real estate and so on. Now we have offices in eight countries. We organise exhibitions in four countries including Bangladesh and we cover garments and textile, auto-component, motorbike, solar power among many other sectors. FINTECH: What was your vision 25 years ago when you started and how that has changed or evolved? As a Bangladeshi, a big part of my vision was to really help Bangladesh move forward. When I visited China for the first time in 2003, I had to show them where in the map is Bangladesh. But now the Chinese are coming to Bangladesh with interest. It’s simply because Bangladesh has been making progress. That’s why there is interest about Bangladesh. But I think that Bangladesh don’t get the promotion it should. In Singapore, there is a lack of knowledge about our progress and you have to explain why they should come to Bangladesh. Indonesia was the same but now many people do know about Bangladesh’s progress, therefore, they understand why it is a good idea to invest in Bangladesh. So, now we think very globally. FINTECH: You are an US based company. But you don’t operate in North America like you do in other parts of the world. Why is that? It’s such a pity that we have to say that we are a US based company. Our company was founded in Bangladesh. We moved to the US in 2004. We feel behind because of some policies related shortcomings. Before that I went to Standard Chartered Bank, Bangladesh Bank and to other funders so that we can do exhibitions in Sri Lanka, Indonesia and other countries. if there is revenue generated from this then you have to take a minimum of 90 percent to that country. So we needed permission for that. But everyone said that it wasn’t possible. If that’s not possible then how can we grow to a multinational company while being a Bangladeshi company? We were forced to move out of the country. If we could stay it would have benefited the country. Modernized exhibition organising helps the economy. 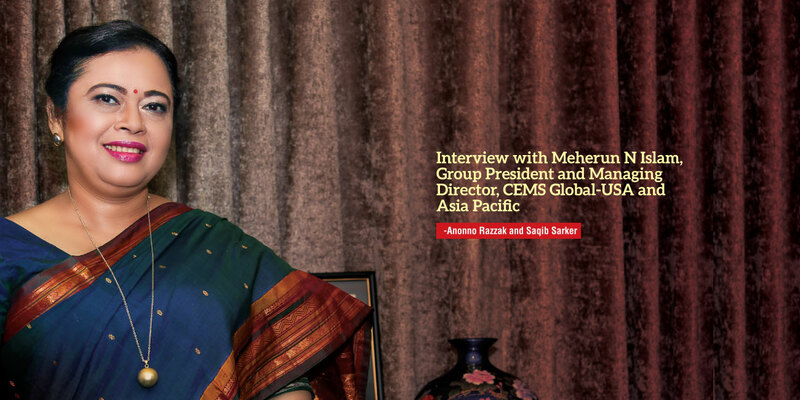 But the way CEMS benefitted from moving out of Bangladesh was that we wouldn’t have been able to build the Bangladesh brand by ourselves and then promote us. Whereas now, it is easy for us to be successful as a US based company. We have a US partner and we created partners wherever we went. You are right, we did not expand our exhibition in the North American market. The reason is North America and Europe is 50 to 60 years ahead of where we are now. That makes it very tough to operate here and compete. In fact, it is quite impossible at this point. However, when we went to South America – in Brazil – we had to prove ourselves there. The same is true for Asia. we had to establish ourselves there. If you look at the market share in terms of population, Asia is still an untapped market. China, India, Singapore and a few other countries like that are doing well, but that’s not the case for everyone. When we started in Sri Lanka in 2007, there weren’t any local exhibition companies there. So, we basically sought out untapped markets. FINTECH: Technology is obviously important in event management. Have you introduced something here in Bangladesh that is new, in security or data management for example? In the developed countries all data are computerized. Initially we had to work manually. That was the norm in the industry. For the past 7 or 8 years we keep record digitally, just like in the developed countries. We have our own software wing, where we develop everything. In all areas of our work technology plays a big role. Our biggest advantage is that we have our own research organisation and IT firm. This really expedite the process for us. For security, we do employ computerized security. Based on which country you are working in, you have to arrange how to distribute your security between automated systems and manual work. So, for example, we have online registration for our events but then we end up doing a lot of on site registration as well, because people are just not accustomed to it. FINTECH: Is working capital important in your business? How important are banks for you? When we started, this business was so new that we didn’t need working capital. We don’t have to rely on working capital now either. We have supporting companies. The biggest capital here is your reputation and acknowledgement in the industry. There are steps that lead to that acknowledgement. Here the screening process is very personalized, in the sense that you have to have personal connections. We need recognition and no business can thrive without it. Because of a lack of understanding about what event management companies do and their scope, we don’t get the recognition that we should. People still think it’s about this as organising parties and things like that. 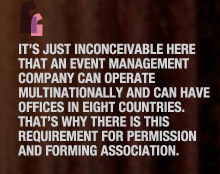 It’s just inconceivable here that an event management company can operate multinationally and can have offices in eight countries. That’s why there is this requirement for permission and forming association. And because there is no recognition the permission process becomes problematic. You have to spend three/four months for getting a permission. FINTECH: How big is the event management industry and where it is going? It’s quite big actually. People who approach in an intellectual and smart way, they have a lot of scope in this sector. A fresh graduate can get into this business and start making a living by organizing small events. But one big problem is that a lot of people want to leap into success without putting in the time. As a result they resort to unethical means and bad practices. And that has an impact. As for how the market for this is growing, you don’t have joint families like before, for example. So, people don’t really have the time to do their own work for a wedding. They need to hire event management companies. Same is true for businesses. In the past, the office staff would do the work for, let’s say preparing gifts for sending out before Pahela Boishakh. But now they need to outsource that. Put everything together, it’s a huge market. FINTECH: How important is insurance in your operation? All of our exhibitions are insured – everything from people to goods. However, I don’t think anyone else in this sector does this. We have many insurance companies but industry hasn’t quite built up yet. There is a trust issue still and that’s why you don’t see companies taking out insurances. We, however, have many foreign clients for whom it is important. They want to know about the insurance policy. FINTECH: Is market analytics important for you. What kind of data you need and/or use? Let’s say we are doing an exhibition for a construction group. There are many construction materials. When a foreign client wants to participate, they will want to know export-import data or market data in general. We survey for these data. Our company for this purpose is Adapt Ltd. We conduct survey for all relevant data and we keep record. 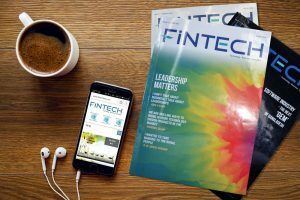 FINTECH: Tell us about your consultancy service. We actually never set out to provide consultancy, but we ended up doing it because of its need. When a company comes to Bangladesh they aren’t familiar with the country. When they are coming through us, there is a natural dependency and trust on us. That’s why we started Adapt Consultancy Service. Our consultancy service is quite narrow actually. We provide clients with the basic knowledge of the market and help them decide how they should come here. We don’t want foreign clients to have a bad impression of Bangladesh. That’s why if it’s not fitting for them we recommend not coming here. FINTECH: Thank you for speaking to us.